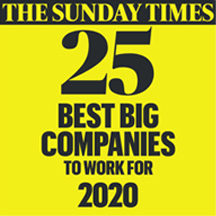 Do you want to work for an award winning company who is part of The Sunday Times 100 Best Companies to work for in 2019? We have an exciting and rewarding opportunity for an individual who is motivated by a fast paced environment and is passionate about delivering a consistently excellent service. The Business Management Support Officer role is part of our growing Business Management team based in our busy IT department. The Business Management Function plays a vital role in supporting the CIO and Senior IT Leadership team in ensuring IT finances and administrative duties are managed and governed efficiently and effectively. As we progress on our journey we are seeking a Business Management Support Officer who will assist IT in the management its finances and effectively provide administrative support for the IT Department. This includes monitoring of IT budgets and spend, co-ordinating the purchase order process and administrative support, ensuring that the Business Management team successfully meets its responsibilities of ensuring the Society’s IT department is well managed. •	In this role you will be responsible for the overall financial and administrative support across a busy IT department. •	You will co-ordinate the Purchase Order process for IT using the Society’s Purchase-to-Pay system including the receipt and processing of IT orders and invoices. •	A positive attitude and excellent communication skills possessing the confidence to engage with a variety of people.